Sport Aid offers a wide range of quality products designed to help you stay active. Supports that help reduce pain and discomforts associated with injuries, accidents, arthritis and repetitive stressors to tendons and muscles. Or use as a preventive reminder! Affordable, long wearing, provide firm yet comfortable support, lightweight, go anywhere support. Try a Sport Aid product for optimum therapeutic performance. Sport Aid is trusted and recommended by healthcare providers everywhere. Medium: 3 inch - 3 1/2 inch (8 - 9 cm). 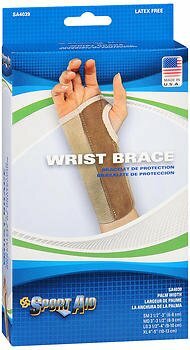 View More In Hand & Wrist Braces. If you have any questions about this product by SportAid, contact us by completing and submitting the form below. If you are looking for a specif part number, please include it with your message.